The Gowanus Lounge: Will City Transfer Parks Dept. 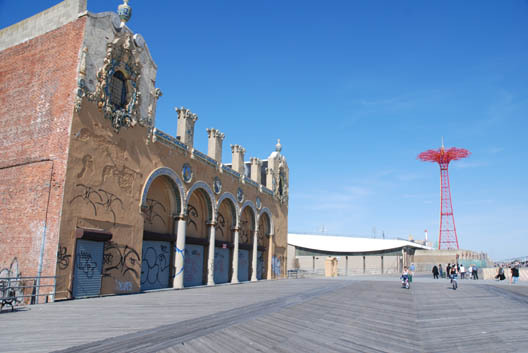 Land to Coney Developer? Will City Transfer Parks Dept. Land to Coney Developer? Several people in the community, when made aware of the negotiations, say a private developer shouldn’t get control of the land. They say the vacant land and waterfront parking lots should be turned into a public park or used for amusements accessible to the working class, such as a new home for Astroland Park. Taconic, which controls a 99-year lease of the landmarked Child’s building and owns an adjacent vacant block, in addition to vacant property north of KeySpan Park, plans to build a mixed-use development on the waterfront site. Plans include ground-floor “entertainment retail ,” housing and “food-related uses” in the restaurant. Carol Hill Albert, whose family has operated Astroland for 45 years, says she’d be very interested in moving her rides west of KeySpan, to land owned by the Parks Department...Albert has, in the past, offered to help the city pay to move Astroland’s rides anywhere in Coney Island, and recently agreed to take them off the auction block in response to pleas from elected officials. But despite the ostensibly fervent effort on the part of the city to keep Astroland in Coney Island, Albert says she often feels put on the back burner, in favor of the big developers like Taconic and Thor Equities, and left to fend for herself. If you've joined the show midway, we should note that Ms. Albert sold the property on which Astroland is currently located to Thor.